Obama won't specify cuts to benefit programs, the Republican says, but aides say he's already done so. 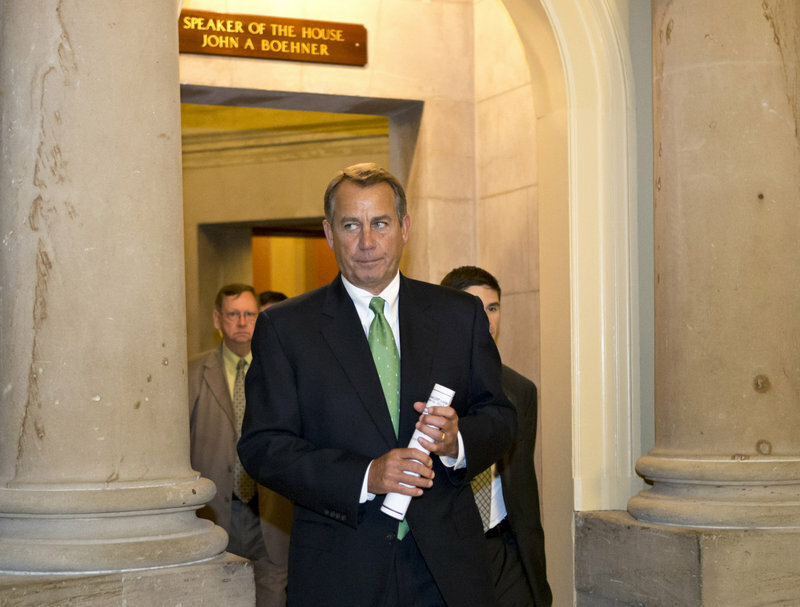 WASHINGTON — In a test of divided government, President Obama and House Speaker John Boehner sought an elusive compromise Tuesday to prevent economy-damaging tax increases on the middle class at year’s end, conferring by phone after a secretive exchange of proposals. Details were sparse and evidence of significant progress scarcer still, although officials said the president had offered to reduce his initial demand for $1.6 trillion in higher tax revenue over a decade to $1.4 trillion. There was no indication he was relenting on his insistence – strongly opposed by most Republicans – that tax rates rise at upper incomes. Boehner sounded unimpressed in remarks on the House floor at midday. “The longer the White House slow-walks this process, the closer our economy gets to the fiscal cliff,” he said, declaring that Obama had yet to identify specific cuts to government benefit programs as part of an agreement that also would raise federal tax revenue. The Ohio Republican made his comments well before he and the president talked by phone about attempts to avert a “fiscal cliff,” across-the-board tax increases and cuts in defense and domestic programs that economists say could send the economy into recession. In rebuttal, the White House swiftly detailed numerous proposals that Obama has made to cut spending, including recommendations to cull $340 million from Medicare over a decade and an additional $250 billion from other government benefit programs. The House Democratic leader, Rep. Nancy Pelosi of California, challenged Boehner to allow a vote on the president’s proposal to extend most expiring tax cuts while letting them lapse at higher incomes. She predicted it would gain “overwhelming approval,” even in the GOP-controlled House. Two weeks before the year-end holidays, time to find agreement was short, but not prohibitively so. “I think it’s going to be extremely difficult to get it done before Christmas, but it could be done,” said Senate Majority Leader Harry Reid. Both sides say they want a deal to prevent damage to the economy, but that stated commitment has been accompanied by a fierce battle to gain the political high ground in negotiations.